There is a time in every child's life where they start wondering how other people are living in other countries as well as other states. It's something that crosses all of our minds every now and then. The view outside of your back porch may be quiet different than the view in another state. What about Asia? If your child asks you what it's like to live in China... Could you answer their question without doing an internet search? Little Passports has changed the way that kids learn about the world we live in. Through their Discovery Packs, your child can travel to another State or Country each month, simply by checking the mail! I recently got the opportunity to receive Month 1 of the World Edition Discovery Kit from Little Passports for my daughters. They love getting mail with their name on it so I was overjoyed when I was able to get the package delivered with both of my daughters name on the label. You can imagine how excited they were when they returned home from their Maw-Maw's house to a box that was addressed to them both. I hadn't opened the box yet since I wanted them to be the ones to pop the top and discover what was inside. When we opened the box, Loran and Jade found a cute, green and blue suitcase. Inside the suitcase was all sorts of goodies including a World map, a passport, A Letter and photo from Sofia and Sam (The 2 kids that take your kids throughout the world), as well as stickers and a couple other things. The girls have a mild obsession for maps, so of course, the World Map was the first thing they investigated It's huge! You can see all of the countries on the map, just like any other world map. The girls like to find America and seeing how many of the other countries they can name without asking for help. Jade and Loran sat in the hallway for about an hour with their new map pressed against the wall. They used their feet to hold it up so their hands could be free to point to each country. 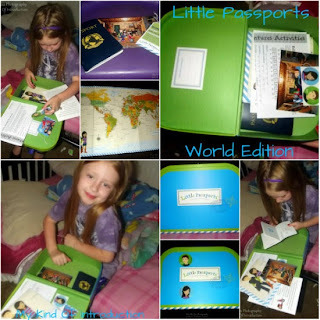 The passport is Jade's favorite from the Little Passport suitcase! It has room for a photo as well as room for travel stickers that come in each package and are themed to the Country that Sofia and Sam are visiting that month. We haven't filled out their passport yet but I'm planning on printing off pictures of the girls soon, so they can have their very own passport photos :) Loran and I share a sticker obsession... I wasn't surprised when she went for the 2 stickers of Sofia and Sam first. She let her sister help her find the perfect spot on the suitcase for each sticker. 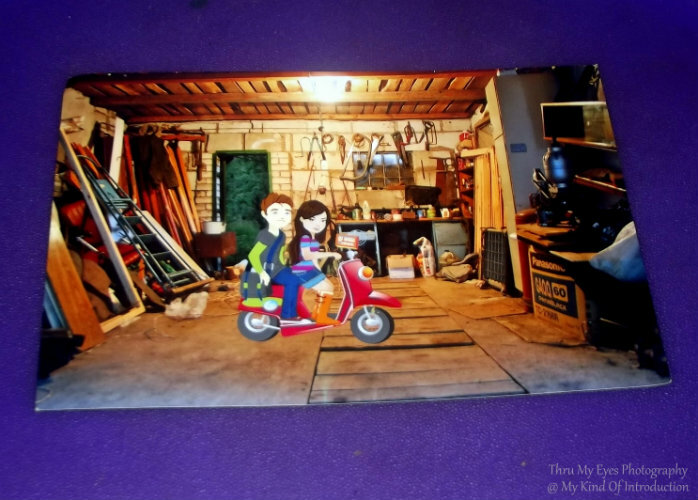 They also enjoyed the photo of Sam and Sofia on their magic scooter in the garage. The photo looks 100% real, everything but the cartoon like kids. I was very amused by this photo! My family couldn't be happier with our Little Passports suitcase and I can't wait until we receive our USA Edition Discovery Kit that Little Passports so kindly offered us, in honor of The Back-School-Blog Party! Little Passports make wonderful Back-To-School gifts for kids of any age! They enhance learning while taking your children on trips that most kids can only dream about. The extra packages even contain souvenirs from the selected country or state! What else could a kid ask for? You'll be surprised at how excited your kids get when the mailman shows up with their package from Little Passports! The Little Passports Review for the USA Edition will run beside a wonderful giveaway that Little Passports has also agreed to sponsor, in honor of our Back-To-School Blog Party!!! Keep an eye out for our USA Discovery Kit review as well as the Little Passports giveaway that will be going live next weekend (August 10)! Gift a Free 3-Month Little Passports Subscription to a Teacher when you place an order of $75 or more. I love all kind of maps! Seems like a really great way to learn about different countries. Thanks for sharing! This looks so cool! I would love this with my girls as they are quite interested in geography and learning about other countries! We'll be getting our first Little Passports package soon! I can't wait! I think it's such a great idea! Your kids are going to love it!!!! Sounds like a great program. My hubby and I take our daughter a lot of places, but we obviously cannot take her everywhere. I like the idea of the Little Passports package. It really is a great idea! We just got the USA package today and it's alot different than the World Edition!! I can't wait to actually open it all up, We just opened the box and closed it back. (Well I did, the girls haven't seen it yet haha) It has a camera!!!! Get Paid for Writing Short Music reviews! How Reading Eggs can help your child! The John Gilliat CD Giveaway! Satisfy your Senses with SoyL Scents! MySoyL "Mommy Time" Back-To-School Giveaway!